Is Australia in danger of being swamped by 24-hour time? 24-hour time is common in Europe, and in the airline industry, and the military. Internally, many industries use 24-hour time, but publicly 12-hour time is dominant in Australia. I have seen 24-hour time used at cafes. Perhaps they were run by Europeans; perhaps it was an attempt to seem more European. V/Line uses 24-hour time in most cases, including on their public timetables — they switched back in 2000. Other public transport operators in Victoria use 12-hour time in public. Except… at the brand new Metro stations… where somehow, they’ve used both on the handy new screens. As you can see, train departure times are in 12-hour time. But the current time is in 24-hour time. Ingenious! Both formats have their advantages. 12-hour is more commonly known, though 24-hour is less ambiguous. But wouldn’t it be better to choose one or the other? I’d love to know how this happened. Is it some devious plan to get people gradually used to 24-hour time? Or did someone just not think about how gloriously inconsistent this is? Update: I’m told it was an error, and the displays will be updated shortly to consistently show 12-hour time. Next → Next post: What can council elections teach us about aspect ratio? Conspiracy or stuff up? Stuff up. I wish they would switch to 24 hour time. It’s becoming more prevalent and certainly has its advantages. The main disadvantage, that a lot of people aren’t fully familiar with it, can only be overcome through immersion. As I have posted in your facebook thread on this, I feel the 24 hour clock should be used as standard. For a while, we need both to be displayed. Maybe have a note at the bottom of this post to say where the “swamped” phrase is inspired from. In 10-20 years people will see your post and think “why the hell did he say that”. As for 24 hour time – I wish all flights were in Greenwich Mean Time or UTC! Especially with the silly daylight saving time. With flights landing around the clock, what if the flight is on a Sunday when the clocks are adjusted? And many people go via Dubai or Singapore. Would it not be better to just know what the current global time is and not have to worry about different time zones – as UTC is the same everywhere. They can show both GMT and “local” time if they like. I will just look at GMT and know exactly what time the flight will take off. V/Line’s usage is somewhat inconsistent. Their widely-used PDF timetables show train times with the 24 hour clock, as they have for years now. 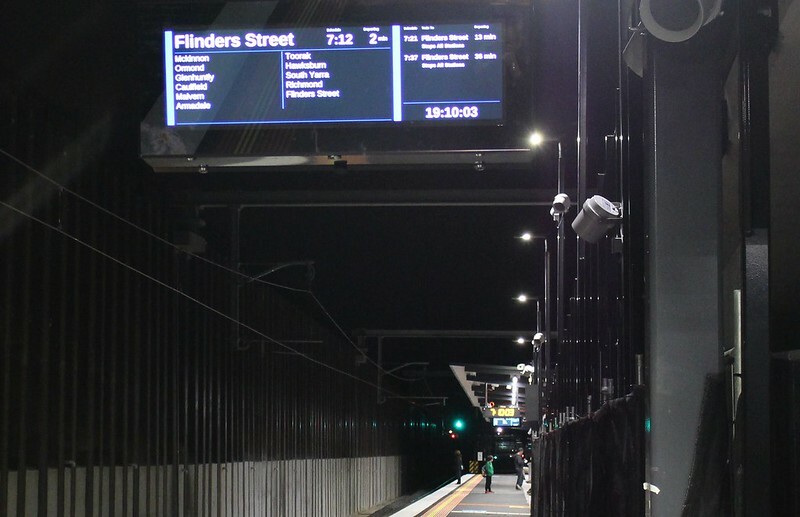 However, the new electronic displays, automated voice announcements, and “green buttons” installed relatively recently at V/Line stations all express train times in the 12 hour clock. Also human-made announcements at stations as well as conductors tend to express train times using the 12 hour clock. Would be good to see some consistency V/Line. Personally I am very much in favour of the 24 hour clock, for the sake of clarity and in line with international practice. 24 hour time is much more sensible and convenient in a transport industry. That display (not a fan of them btw – too small) – obviously a configuration error. now that trains run 24 hours, they should definitely switch to 24 hour time. In fact, PTV should mandate it. There are some displays at Southern Cross where Vline trains are shown next to Metro trains where 1 is in 12 hour time and the other in 24 hour time. Now that is plain ridiculous. PTV is supposed to be coordinating the system to make it easier for users. Having consistent time standards would be a good start. The main place where 12 hour time is still used on public transport is America and they are also still using the imperial system of weights and measures. 12 hour time is a relic of the past and we should follow Europe’s lead. We have adopted the metric system and we should also adopt 24 hour time. I think we should really leave the old systems behind and get away from all this modulo 12/24 and 60 business. Let’s have decimal/metric time. We should all adopt 24 hour time already. It’s the 21st century. 12 hour clocks are a relic of the dark ages. There are 24 hours in a day, therefore a timekeeping system that reflects that with no ambiguity makes sense. It’s fine if in social settings we just verbally use 12 hour a.m/p.m time, but anywhere that a computer is keeping track of time – it really should be using ISO 8601 standard of date and time keeping.